They say that nature moves you. I've shed a few tears from close encounters with God's grandeur, and nature may have schooled me on a thing or two about life. One of my more persisting musings is from a trip to the Rainbow Nation. I was #blessed to tick off an item from my bucket list when I traveled to South Africa around this time last year. When I was younger, I remember wanting to go there because I heard they had penguins on the beach, and because it sounded exotic and far away. When South Africa hosted the World Cup in 2010, I did some research on the country and wanted to go even more. Never did it cross my mind to actually do it since it was as distant as a dream. However, with great timing (BPI Singapore Airlines sale), the best travel partner (boyfriend who was super game), and months of highly controlled budgeting, I somehow managed to make it to the not-so-dark continent. To say that South Africa was majestic is an understatement. I was overwhelmed by the country's natural beauty. One of the highlights of the trip was driving from Cape Town to Hermanus, a whale sanctuary. Sadly, there were no whale sightings. I wanted to cry when passing through the breathtaking Atlantic coast and stunning landscapes you can imagine dinosaurs grazed millions of years ago. The second highlight was the hike up (and down!) 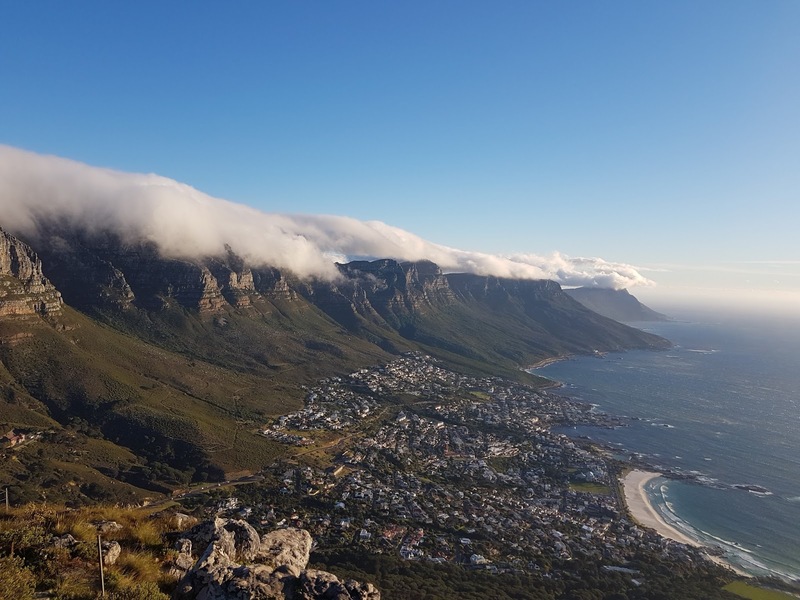 Lion's Head, with its panoramic view of Cape Town, the Atlantic Ocean, and the dramatic Table Mountain. The third highlight was driving through Mpumalanga's Panoramic Route, which ended with the enchanting beauty of the Blyde River Canyon, one of the largest green canyons in the world (biggest in Africa). Everything was picturesque and moving. It makes me wonder if collective efforts of zero waste, diligent adherence to the 5 R's, and conscious consumption can help preserve our earth's rapidly disappearing natural beauties. Realistically, conscious consumerism won't save the world -- not alone, anyway, as articulated by this MUNI entry. I agree that conscious consumption and going zero waste isn't enough, but it's a good step forward. If my actions can help save the environment in any way possible, sign me up. Despite South Africa's natural splendor, what stood out most was the respect locals have for nature. I noticed this most remarkably with our safari guide. His knowledge on African wildlife was obviously extensive (comes with the job description! ), but what amazed me most was his passion and genuine respect for all parts of nature, especially the circle of life. Everything plays a specific role that contributes to the greater environment. Lions and other apex predators make sure the ecosystems aren't overpopulated, vultures and other scavengers do the dirty work and clean up predators' victims, and so on. I'm no expert on ecosystems or on the circle of life, but it seems that nature's design is pretty tight. If this is so, then why is it vulnerable? Oh right, our bad! There was a drought when we were in Kruger National Park, and the watering holes had turned into empty patches of dirt in the ground. This was surprising since it was supposedly springtime. My first thought was "Is this the watering hole? Where's the water?!" My second thought was "Is this our fault?! Has climate change driven our watering holes to dehydration?" Unfortunately our safari guide was no longer around when we saw this, and there aren't many resources online that answer my question. I wouldn't be surprised if it turns out we all play a role in the disappearing act of the watering holes (and riverbeds, glaciers, etc.) despite being so far away. I've got so much unfinished business in South Africa, starting with 2.5 of the Big Five (I only saw water buffalos, elephants, and a set of hippo ears). There's really far too much to take in there, and more to find than can ever be found, especially in the span of an 8-day vacation. Being an outsider in the wild opened my eyes to how precious environmental balance is and how critical our roles are in protecting that balance. It would be the opportunity of a lifetime to be there and study that wildlife and what we can do to preserve it since the Internet would not suffice. There's more to do than can ever be done to make life better for everything on this planet, regardless of how many legs or limbs they have. We need to play our cards right and make sure our kids and their kids don't live in a world where penguins and rhinos are extinct. For now, I'll have to make do with whatever I can to save the earth, and see what else can be done to protect the circle of life! PS - Big thanks to Johan for the push and purpose of this post. PPS - I may or may not have listened to Circle of Life on repeat while writing this entry. I'M CRYING! I loved reading this post and was so saddened to learn about the (boiling) watering holes.